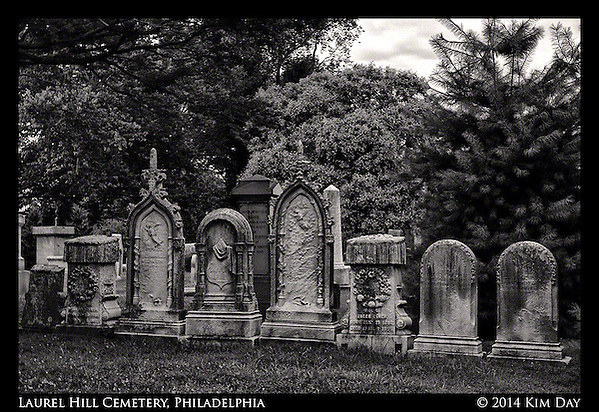 I’m not sure what it is about old cemeteries that fascinate me–the mausoleums that are monuments to historic excess, the sculpture, the peacefulness or just the difference between the sterileness of the flat markers found in the modern cemeteries of today. I’ve never been a “visit dead relatives at the cemetery” kind of girl, nor do I particularly have any desire to be interred in one (I’m more of a “cremate and sprinkle in pretty location” kind of girl). But, fascinate me they do. I’ve walked the stately roads of Père LaChaise Cemetery in Paris among those paying homage to Mozart and Jim Morrison. I’ve spent a sultry afternoon walking under the moss draped trees at Bonaventure Cemetery in Savannah with a camera to capture its unique and spooky southern charm. 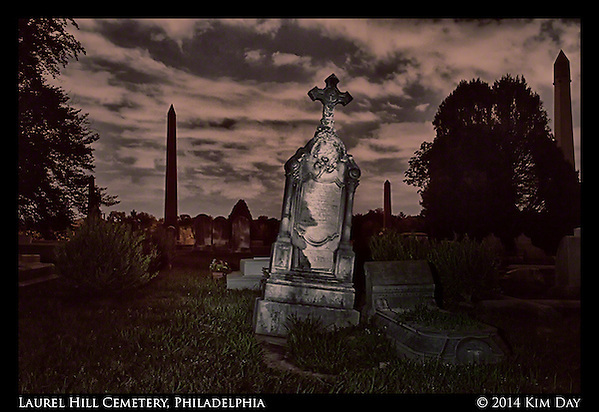 And on Friday night, I made a return pilgrimage to Laurel Hill Cemetery in Philadelphia for their Lunar Stroll. The group of photographers gathered just as the sun started to set. While I waited for the group together I wandered impatiently among some of the graves near the entrance. On my last trip, I focused primarily on the wealthy long dead in Millionaire’s row. 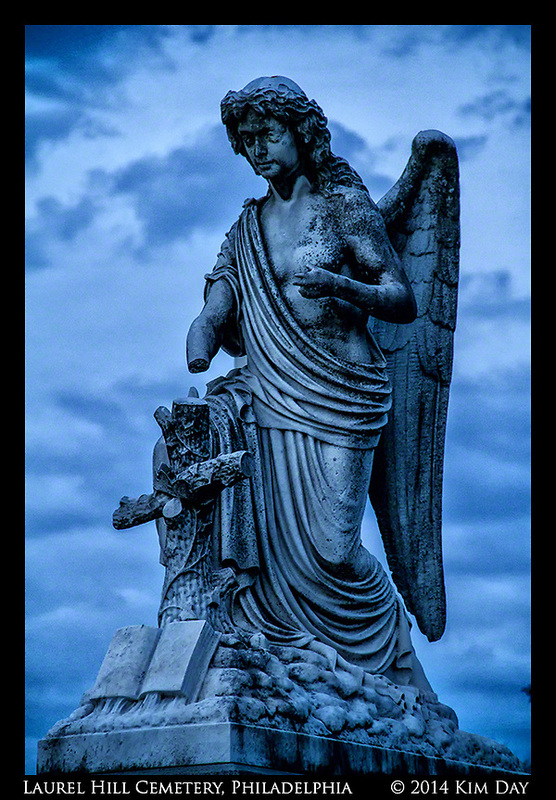 On this evening, as the sun dropped below the horizon, I chose to wander through the area of the cemetery filled with obelisks and statuary. 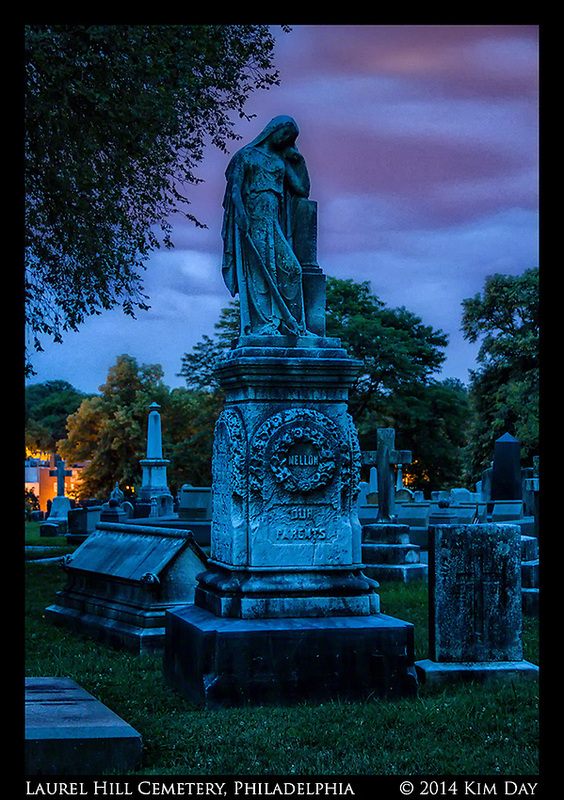 The cemetery plots were cloaked in a soft blue light, mixing with the faint echos of sunset pink. 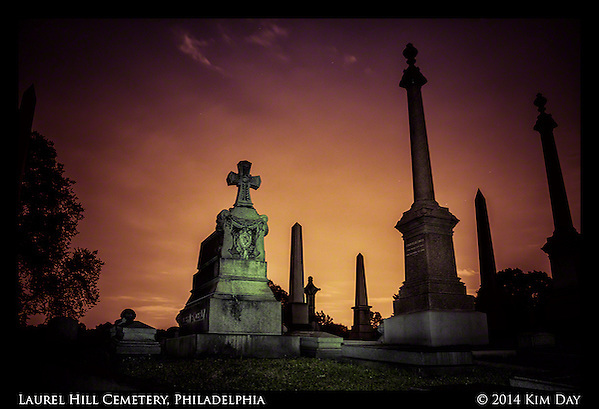 As the blue deepened into night, the sky grew darker and picked up the reddish hue from sodium lights dotting the Philly skyline, bathing Laurel Hill in a eerie light. I wrapped up the night’s shooting with a long exposure of the Ford Road Bridge with its arcing colorful lights. This entry was posted on Sunday, July 20th, 2014 at 9:22 PM. 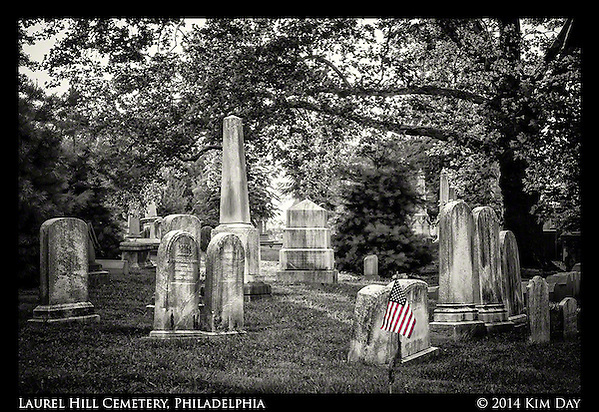 It is filed under Globetrotting: Near and Far, Philadelphia and tagged with Black and White Photography, funerary sculpture, Laurel Hill, Laurel Hill Cemetery, Light Painting, Lunar Stroll, mausoleum, Night Photography, old cemeteries. You can follow any responses to this entry through the RSS 2.0 feed.